Apple’s (NASDAQ: AAPL) video streaming service is believed to be the biggest product/service launch by Apple in 2019. Many bullish analysts have already pointed to the long term growth potential of this service which will drive Apple stock higher. However, we need to look at the options offered by Apple within this service. Currently, Apple does not have decent original content to attract subscribers. It will be relying on third-party premium content to drive subscribers. This removes any unique feature that Apple can offer to subscribers who already use another service. Price is one of the only competitive options available to Apple and this will end up lowering the margins. The argument that it will allow a stronger ecosystem also isn’t valid because Apple already boasts of a highly loyal iPhone and wearables base. Investors should look at the net subscriber additions of the new services, but they should also focus on the impact to margins and long term impact on Apple stock. Apple does not have a solid original content library to attract users. It is already facing some issues in building new content. Some reports have mentioned continuous interference by Apple executives to tweak content in line with Apple’s brand image. Even if Apple is able to supercharge its original content efforts, it will be a number of years before it can rival Netflix (NASDAQ:NFLX) or Amazon (NASDAQ:AMZN). In the meantime, Apple has to rely on third-party content that already is available on other streaming services. There are two big problems with this strategy. The first problem is that Apple would not be offering a very differentiated product in the marketplace. The only way it can attract new subscribers is by giving massive discounts on a bundled content option. Apple can sign up HBO, Showtime, and Starz. All these options can be offered in a single bundle at a competitive price. The price would need to be attractive enough to get users to cancel their current subscriptions and move to Apple’s video streaming service. The second problem is that all these streaming options are already available on App Store. Hence, Apple receives a decent chunk of high margin commission from third-party content (a fact that encouraged Spotify (NYSE: SPOT) to file an anti-trust suit against Apple). Moving them from App Store to a dedicated video streaming service would not move the needle in terms of incremental revenue. Apple would also be investing heavily in building the technological platform for video streaming. This should lower the margins for the video service compared to the commissions obtained on the App Store. One of the positive factors cited for this service is the possibility to gain greater brand loyalty and build a stronger ecosystem. However, even the most bearish analysts agree that Apple has a very high retention rate in its products. New video service will not noticeably increase the retention rate. 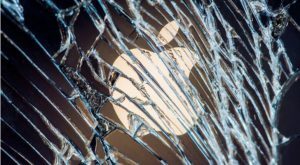 The problem Apple faces is an increase in the upgrade cycle. This is the main factor which is hurting unit sales and Apple stock. It is not clear whether a streaming service will make more customers upgrade their iPhones. Spotify has not been able to increase the price of its service in the past decade. It has not even matched the inflation-adjusted price since the launch date. Similarly, Apple Music has not been able to increase the price. 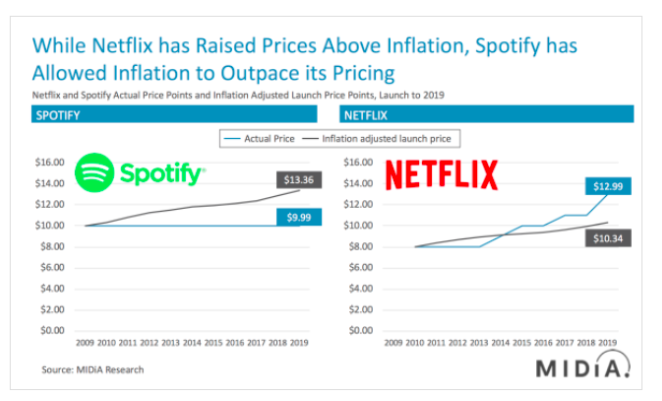 Netflix has been able to gain pricing leverage and increase prices above the inflation-adjusted price. This was possible because of its original content investments. Netflix will not be a part of the video service by Apple. Hulu will also not be a part of the video streaming service. It is upping the ante with bigger discounts in the combo offer with Spotify. We could see discounts or free options from competitors who would be willing to take a short term margin hit to maintain their subscriber base. In this scenario, Apple really would be taking part in a race to the bottom as far as pricing for its video service goes. Apple Music has done relatively well in increasing the subscriber base. But the gross margins in this segment are estimated to be less than 15% compared to over 90% for App Store. We could see a similar situation in video streaming. In order to build an attractive pricing offer, Apple would need to cut its commissions in the video streaming service. Lower commissions will end up causing marginal growth in the bottom line. This will negatively impact Apple stock. Once the dust settles over the new streaming service, we should get a better picture over its long term growth potential. Moving premium streaming services from the App Store to a bundled video streaming can cause a big decline in margins. We will only find the exact impact after a few quarters when the trajectory of subscriber additions becomes clear. 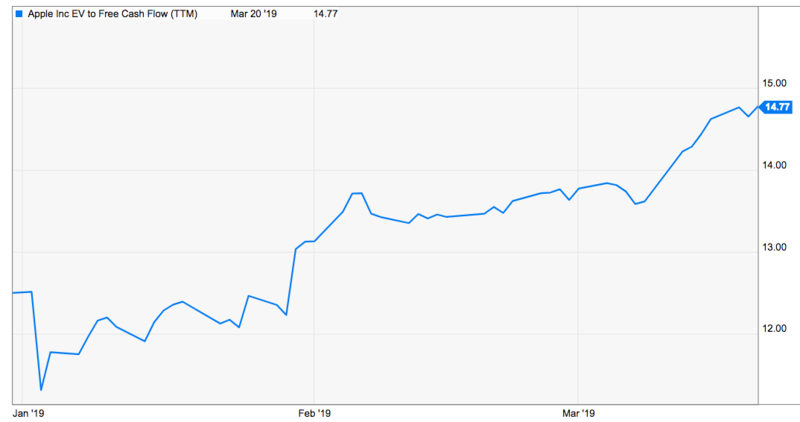 Apple stock has rebounded strongly since hitting the bottom after lower revenue guidance in early January. But the long term headwinds for the company are still there. The challenges of slowing iPhone sales, longer upgrade cycle, stiff competition in international regions will continue to limit the long term bullish run for Apple stock. Apple’s streaming service will need to compete on pricing alone due to lack of original content. Competitors can also increase their discounts or enter into a partnership to offer better combo offers. This will lead to a race to the bottom which will impact Apple’s margins negatively. Apple’s video service bundle will be adding a number of third-party content which is available on App Store where it gets huge commissions. This should lead to lower incremental revenue. Apple is making a big bet on the streaming service. But the actual impact on the bottom line and Apple stock would be marginal for the next few quarters. Investors looking to make a bet on Apple stock on the basis of the new streaming service should look at the growth potential of this service and the near term challenges faced by the company. Article printed from InvestorPlace Media, https://investorplace.com/2019/03/nothing-about-streaming-makes-apple-stock-more-appealing/.